Now that most businesses have embraced social media as a highly effective channel to reach their community, it’s important that they measure their return on investment (ROI). Initially, this may seem like a daunting task because it’s not very clear what to measure or how to do it. Now that you have a better idea of WHAT you should measure, let’s take a look at a few of the tools you can use to obtain this information. There are numerous tools available to help measure the effectiveness of your social media efforts, here’s a brief description of what data the most common tools can deliver. Google Analytics can help analyze the user journey, identify referring sources and create conversion reports. The ShareThis plugin shows what content was shared through various social networks. Market perception information can be obtained with Simply Measured. There are numerous other useful tools that can help you harvest data to support ROI, but these should give you a good start. 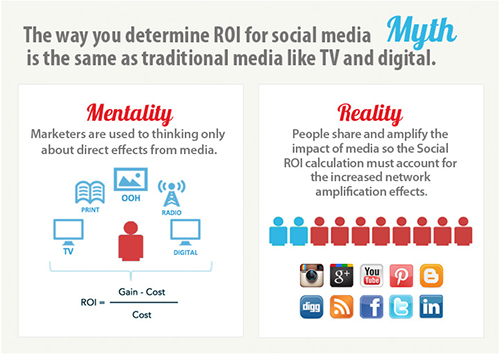 Unfortunately, there is no set “Social Media ROI” formula, it will vary based on a number of factors. However, there are a number of useful metrics and tools you can utilize to monitor the effectiveness of your social media efforts.